A radiant and enlivening fragrance inspired by the ethereal nature of The Garden of Eden. 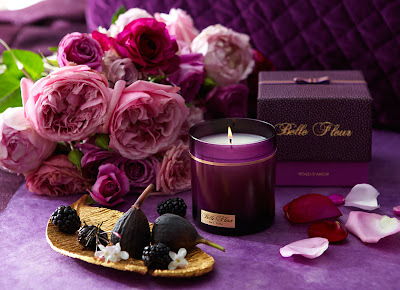 Belle Fleur set out to capture the sublime nuances of assorted blossoms with the sensuality of luscious fruit. With fresh apple, crushed rose petals, a mix of luscious berries and tender fig, the fresh fruity floral notes and the silkiness of sandalwood will remind you of how beautiful it is to fall in love. A sinful but guiltless pleasure that takes you beyond the here and now. Belle Fleur describes this scent as radiant and ethereal. It is definitely radiant! Belle Fleur Petals d'Amour reminds me a little bit of Voluspa Coeur de Cassis with it's playful and pungent fruity notes resting on an earthy base - intense without being heavy. The black currant comes through strong but the Bulgarian rose is loud and clear. I love the slight hint of fig that offers a green note to neutralize the floral and fruity notes. This is a lovely scent if you like a youthful, lively rose. Pair this candle with the Juliette has a Gun Lady Vengeance perfume for they ultimate gift to woo the woman you love. Burn quality 4/5. Fragrance intensity 4/5.